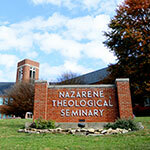 Nazarene Theological Seminary (NTS) is integrating neuroscience into the core of its Master of Divinity curriculum. In the standard introductory course, through various readings and guest presentations from a local neuroscientist, students will examine the neuroscience behind habit formation and how it impacts physiology. In the middle of their program, students will engage Christian Ethics through the lens of the neuroscience of decision-making. Finally, in the senior capstone course, students will analyze case studies that push them to engage their ministry context and demonstrate competency in, and appreciation for, the intersection of neuroscience and the Christian faith. NTS is also making connections to scientists throughout the Kansas City area in an effort to increase trust and promote continued conversation among the faculty and students on important issues in neuroscience. This was partially realized in an NTS sponsored event on youth and neuroscience. We hope this will become a standard student experience in the coming year. Finally, we are excited to host a conference on Neuroscience and Corporate Holiness in Fall 2019. Several science faculty and students will be invited to participate in a constructive dialogue on the importance of neuroscientific discoveries on the way we understand and articulate the Christian experience in churches and the public square.